I’m taking a sick day, today, because I am sick. Darn that little coughing climber, next to me, at the gym, yesterday! Or, perhaps more realistically: darn me, for doing 2 hours at the climbing gym in the morning, then a 75-minute power yoga class, in the evening. Silly rabbit. 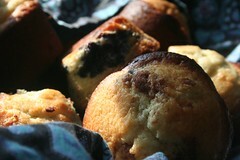 The photo is of the Blueberry Cinnamon-Burst Muffins that I made on Saturday evening. I hope you can see the burst of cinnamon, at the center of the photo.